Now that we've moved into our new house, gotten unpacked, and slowly getting settled, I got around to installing my wine racks in the basement (or "cellah" as they're known in New England) over the holiday weekend. I had a good laugh, because like all of my projects, this one also required a trip to the hardware store. My former basement had cinder block concrete walls that yielded relatively easily to my regular power drill and a masonry bit. My new basement has poured concrete walls that were pretty resistant to my drilling attempts. After whirring away for several minutes without getting anywhere, I gave up and made the trek to Home Depot and bought a hammer drill. What a difference the proper tool makes. Once I got the hang of it, that drill cut through the concrete like buttah, although I still broke two masonry bits when I hit a rock that I couldn't break through. Once all the holes were drilled, it was a simple matter to install the racks that I had moved from Michigan. The final product is shown in the top right photo. The racks are made of redwood and were purchased from International Wine Accessories as a pre-made kit. The vertical supports were already assembled, I simply had to fasten the horizontal supports and attach the base units. 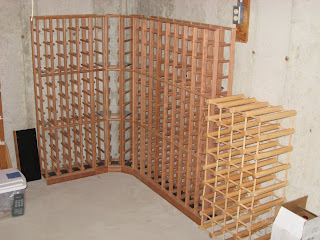 While not the most inexpensive wine racks, these were a quick and easy way to get some professional looking wine racks. The IKEA dowel and stick rack beside the redwood racks has been around since my graduate school days! A cheap alternative, I keep it around out of shear inertia and because I have more wine than fits in the main racks! The second photo tells the rest of the story. I started unloading some of the boxes yesterday (the wine on the floor), but I've still got all the other boxes to unload and rack. 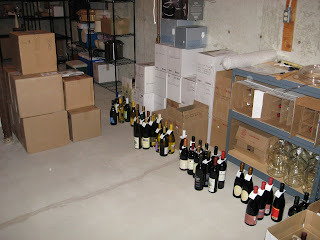 The pile in the center of the floor is the commercial wine, while the boxes along the wall are my homemade wine. Methinks that I'm going to need to expand my racking system to fit everything!